Daniel Scioli, Mauricio Macri, and Sergio Massa are the main presidential candidates for October 25. On August 9, Argentines chose who will be on the ballot for president in this year’s national elections on October 25. Nearly 32 million people were eligible to vote in Sunday's Open Simultaneous, Mandatory Primaries, or PASO, and three leading political coalitions garnered almost 90 percent of the votes. The three frontrunners for the presidency are Daniel Scioli of the Victory Front coalition, Mauricio Macri of the Let's Change coalition, and Sergio Massa of the United for a New Alternative coalition. With 97.8 percent of the votes counted by the National Electoral Direction, Buenos Aires Governor Daniel Scioli came out as the winner of the primaries, getting 38.5 percent of the votes. Scioli was the sole candidate from the party of President Cristina Fernández de Kirchner, who has an approval rating of nearly 50 percent. Scioli was the vice president of Fernández de Kirchner’s late husband, Néstor Kirchner, from 2003 to 2007. Carlos Zannini, currently a member of the president’s cabinet, is Scioli's running mate. Speaking at Luna Park in Buenos Aires on the night of the PASO, Scioli dedicated his victory to Néstor Kirchner and said the numbers demonstrated Argentines’ support for “the government’s foundation.” Scioli explained he will maintain what needs to be maintained, deepen what needs to be deepened, and change what needs to be changed “with my own style,” he added. Second place went to Mauricio Macri, who had 24 percent of total votes and defeated two other competitors from within his own coalition, Cambiemos, or Let's Change. Among those who voted for the coalition, Macri had 80 percent support, against 11.5 percent that went to Ernesto Sanz and 7.8 percent to Elisa Carrió. Macri, who represents the opposition to the ruling party, is the current mayor of Buenos Aires, the largest electoral pool of the country. His campaign has been critical of the government’s economic policy but has backed off from criticizing Fernández de Kirchner's popular policies to expand welfare, says The Economist. Macri’s election results puts him at a favorable situation for the upcoming October 25 vote. After the PASO, the candidate said he could get the 45 percent of votes needed to win the election outright and avoid a runoff, though some doubt that. Following with 14 percent of the votes, Sergio Massa took third place, representing the coalition United for a New Alternative (UNA). The mayor of Tigre, a town on the outskirts of the capital, Massa started exploring a presidential campaign on June 2013 when he left the ruling party. Massa was once Fernández de Kirchner’s government chief of cabinet between 2008 and 2009. His results were lower than predicted, but he defeated fellow UNA candidate José Manuel de la Sota by garnering two-thirds of votes cast for the coalition. Pollsters had projected an even lower result for him in the days leading up to the PASO, and Massa said his better-than-expected results showed the progress of his campaign, and the mandate going forward. Why Is the PASO Important? Forty percent is the magic number presidential candidates typically want to get in the PASO to be confident going into the next round of elections. In Argentina, a candidate can be declared president if he or she receives 45 percent of the vote in the general election, or, alternatively, 40 percent with at least a ten-point margin over the runner-up. In 2011, Fernández de Kirchner had 50 percent of the votes during the PASO. With much disagreement among pollsters, the PASO is an essential opportunity for candidates to test their strategies and public perception. “The PASO elections are a true thermometer for what each candidate’s chances are going into October,” says Juan Cruz Díaz of Cefeidas Group. Considering the difference between the frontrunners’ numbers, the PASO this year demonstrated candidates could have a tight race ahead of them. Three other candidates—Margarita Stolbizer, Nicolás del Caño, and Adolfo Rodríguez Sáa—got more than the required 1.5 percent of votes in the PASO to be able to run for president in October. Five other coalitions participated in the PASO but did not hit the mark to be on the ballot. As Argentina’s 2009 electoral law requires, the PASO is open for everyone living in the country that is eligible to vote, and this is the second time Argentines’ votes will determine the presidential ballot since the electoral reform. Voter turnout was around 72 percent for this year’s PASO, down eight points from 80 percent in 2011. The low turnout was partially blamed on heavy rains on Sunday, which forced polling sites to be moved in 28 districts around the country. This year, nearly one million 16- and 17-year-olds were eligible to vote for the first time in the PASO, representing nearly 3 percent of total eligible voters. Argentines also decided who the main candidates for the government of the province of Buenos Aires would be. More than 40 percent of the votes went to the Victory Front and Aníbal Fernández, who will face María Eugenia Vidal of Let’s Change, UNA’s Felipe Solá, the Progressive Front’s Jaime Linares, and Workers’ Leftist Front candidate Néstor Pitrola. 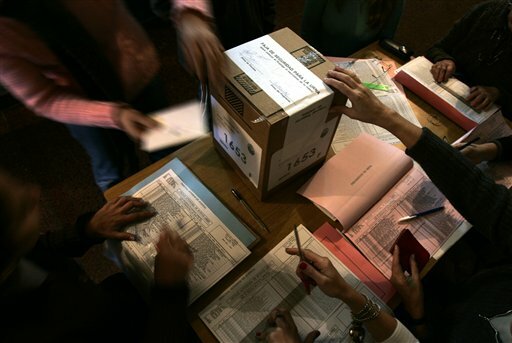 Voters also elected 130 representatives to the lower house, 24 senators, and, for the first time, 43 regional and national Mercosur parliamentary representatives in this year’s PASO.